Is it a comedy or a horror flick? Ike Barinholtz (center) and family prepare to carve each other up in The Oath. The Oath is a black comedy so dire it comes as a relief when the characters try to murder each other. 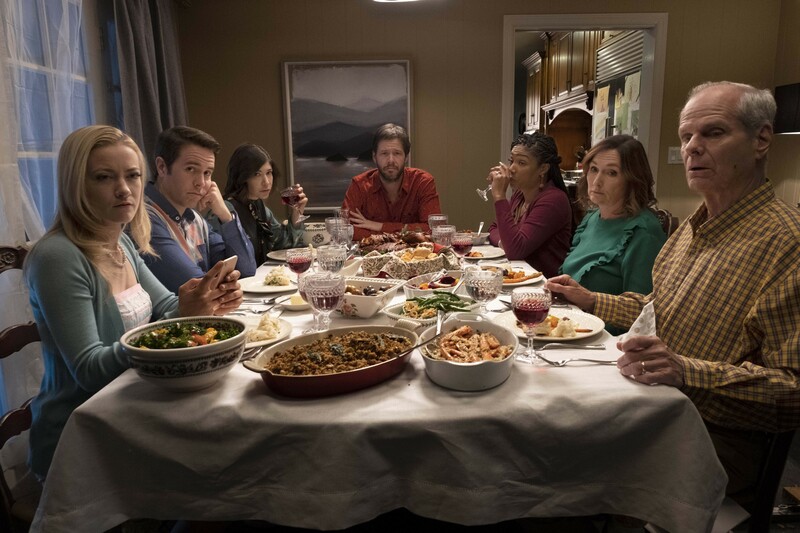 The suburban family of Chris (writer-director Ike Barinholtz) and his wife Kai (Tiffany Haddish) is dreading this year's Thanksgiving dinner. The main headache is the Patriots Oath, a White House directive that asks everyone in the country to sign a loyalty oath to the (unnamed) president. The rules state that no one is being forced to sign, but there are perks — we might think of them as civil rights — for those who go along. Everybody else, well, you've been warned. The deadline is Black Friday, the day after Thanksgiving, and neither Chris nor Kai intend to cooperate — they despise the president. Into this unnerving situation come the relatives. Chris' belligerent brother (Jon Barinholtz, Ike's real-life brother) and his whiny girlfriend (Meredith Hagner) are rightwing POTUS supporters, as are Chris' parents (Nora Dunn and Chris Ellis). Chris' liberal-minded sister (Carrie Brownstein) is on hand with her sick husband. Kai the hostess is the lucky one — none of her relatives can make it. The diners soon begin verbally assaulting each other. The dreadful dinner party is then interrupted by a pair of agents (John Cho, Billy Magnussen) from the Citizens' Protective Unit, a division of Homeland Security, responding to a complaint. Matters degenerate rapidly from there.